pleasant and relaxing. Perfect for couples of all ages. 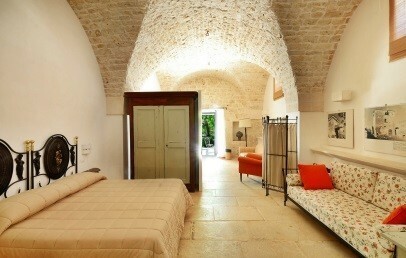 Located in the heart of Valle d\'Itria in the territory of central Puglia, Masseria Fumarola is a few km from Martina Franca, a baroque town with nearly 50,000 residents. 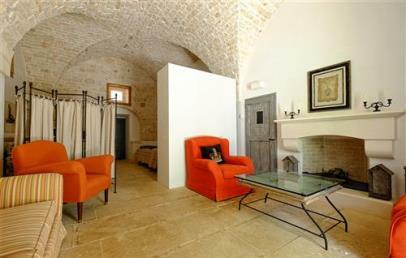 The Masseria is about 65 km from Brindisi Papola Casale airport and about 80 km from Bari Palese airport. 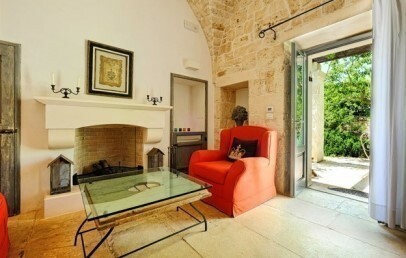 Ideal starting point for visits to historical and cultural excursions, Masseria Fumarola is a country house furnished with taste and elegance, respecting the original structure from which it was obtained. Masseria Fumarola is in fact an ancient farmhouse dating back to 1800, where modernity and tradition come together and where guests will feel at home. Decorated with bright colours where the predominant is white. 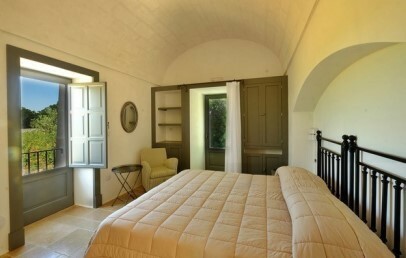 Junior Suite (Vignale 1, 2, 3) – double or twin room, distributed between the garden and the farm yard, equipped with a fireplace. Junior Suite Superior (Arco and Casale) – double or twin room with the possibility of adding an extra bed, very different furnishings one from the other and both are equipped with modern comforts. 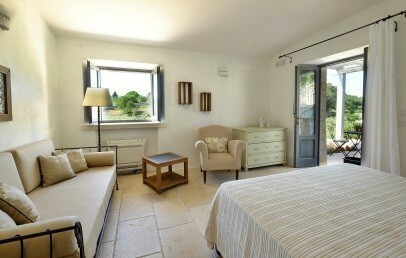 Suite Deluxe – the Trullo Sovrano, double or twin room with the possibility to add an extra bed. Suite – are 6 Suites in total, double or twin room with the possibility of adding an extra bed, each one has different furnishings and all are equipped with modern comforts. Master Suite (Massaro 2, Palmeto 1) – double or twin room with the possibility of adding 1 or 2 extra beds (Quadruple Room measures approximately 40 sq.m. ), different furnishings and size, both equipped with modern comforts. The delicious dishes for breakfast, lunch and dinner are prepared with local products are served in the manger, transformed into a cozy gathering place to enjoy the typical flavors of Puglia. By the pool guest can enjoy a light lunch. 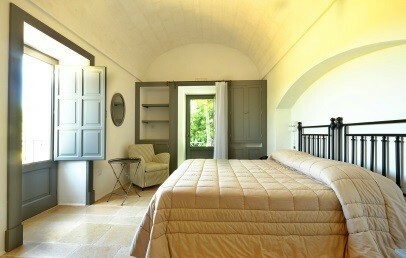 Comfortable Junior Suite, placed between the courtyard and the garden of the Masseria. Furnished with simple elegance, it’s characterized by a vaulted ceiling and a fireplace, becoming the ideal ambient for a total relax among fresh and surrounding colours. It features all of the modern comforts, plus a reserved outdoor space. The “Masseria Fumarola” has available for its guests a total of 4 Suites with different characteristics like view (on the wood, on the court yard or on the internal garden) and either double or triple internal spaces. 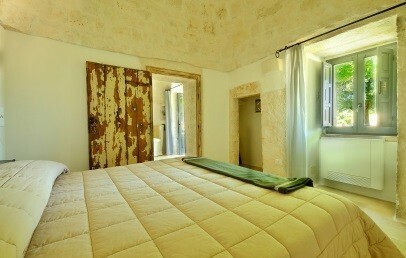 They are furnished in rural style, with all the typical comfort and elegance of the apulian tradition. 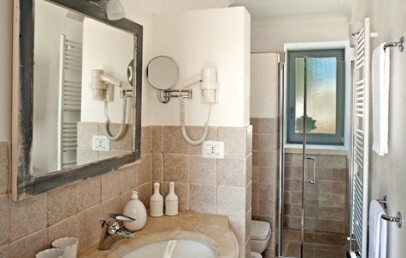 One of the Suite has a Jacuzzi while the other two have a shower in the private bathroom. 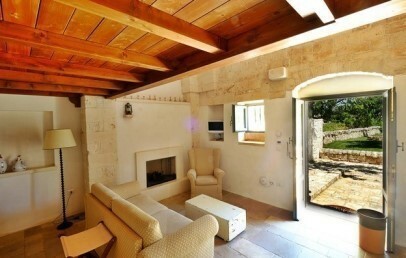 All rooms have an ample fireplace and a reserved outdoor space. 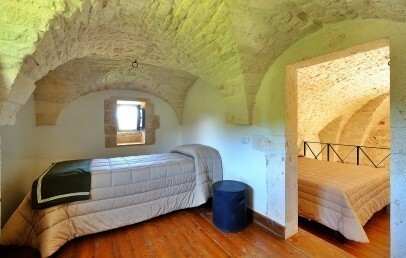 There are two rooms belonging to this category: A Trullo of 25 sq.m. 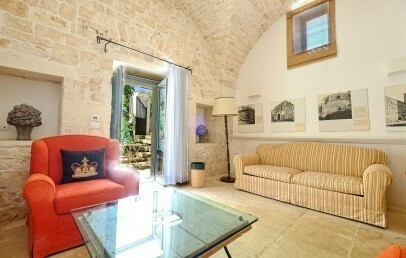 suitable for 2 people, located in the main house of the family; The second room is a comfortable room of 30 sq.m. which can accommodate a max. 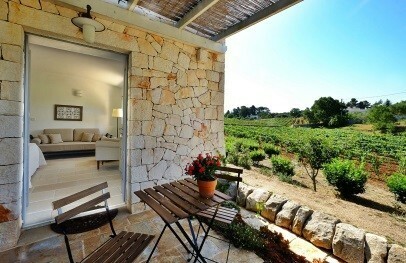 of 3 people and is embedded in the vineyard with a little private veranda. This room was once the main room of the Fumarola family. 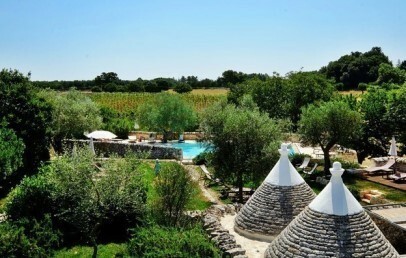 The Trullo Sovrano is the biggest Trullo of the farm. The room also has a living area, which was once the old family kitchen. This is the only room that has double exposure with double private outdoor area. Mandatory extra for the baby (0-3 y.o. ): € 10,00 per day.